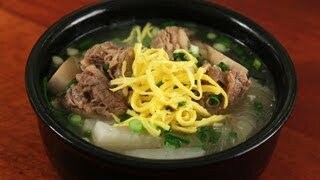 Today I’m going to show you how to make Korean beef short ribs soup, called galbitang (갈비탕). Galbitang is not a light meal – it’s very rich and hearty. If you need to fortify yourself it’s a good choice. I’m going to show you 2 versions: spicy and nonspicy. When Koreans think about galbitang, they picture the nonspicy version as the quintessential example of the dish. It’s always served with fermented kimchi, which offsets its heaviness. If I don’t have any kimchi, I need to make some before I begin to prepare this dish. I can’t eat galbitang without kimchi. I first tried the spicy version when I was in university. I went to my best friend’s house in Mokpo and her mom made this for me and her family for breakfast. Mokpo is a harbor city, and so she served it with a full table of sidedishes, many of them made with seafood. Even at that early hour we ate raw fish! It was so delicious! I had never heard of or seen spicy galbitang before that morning, but the memory of sitting with her whole family around a table full of delicious sidedishes has stayed with me ever since. I miss that food, and I miss that atmosphere. Probably you can think of a similar time in your own life. Like oxbone soup, galbitang is something you can make ahead of time in large quantities and then put the ingredients together at the last minute and serve. As I mention in the video, when you’re making a large amount you can put it in the fridge overnight so the fat solidifies at the top of the soup where it can be easily removed. If you’re making just a few servings like I do here, the cheesecloth method works very well. Hot pepper flakes, soy sauce, and sesame oil. Called gyeran-noreunja-jidan (계란 노른자 지단) in Korean, they are a colorful garnish for the nonspicy version. 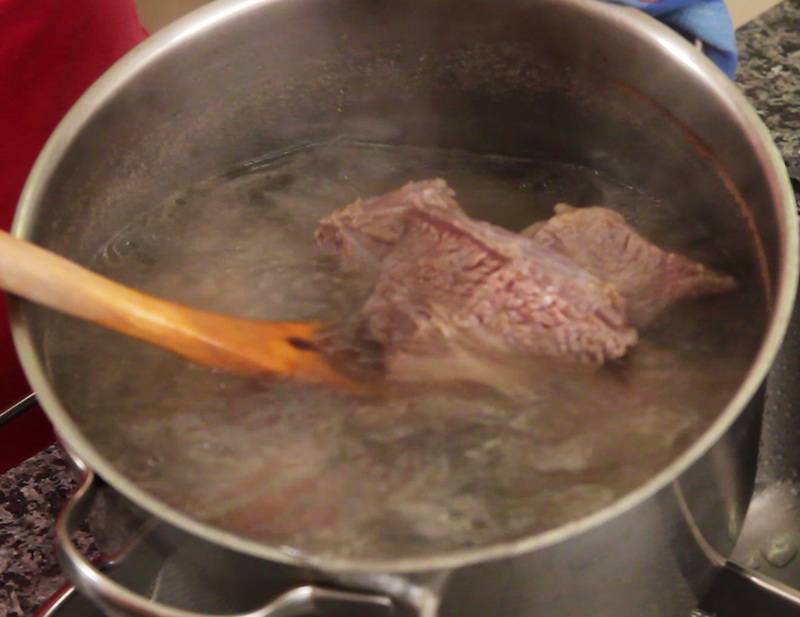 Rinse the beef short ribs in cold water a couple of times to remove any residual blood and bone fragments. Soak in cold water. Drain the ribs and blanch in a large pot of boiling water for 10 minutes. Strain the ribs. Wash each one thoroughly and remove any visible fat. Clean the pot, too. Put the clean ribs back into the pot and add radish, onion, and 12 cups of water. Bring to a boil over medium high heat for 1 hour, and then lower the heat to medium and boil for another 1 hour. Remove from the heat. Discard the onion and put the ribs and radish into a stainless steel bowl. Strain the broth through a cheesecloth in a strainer. 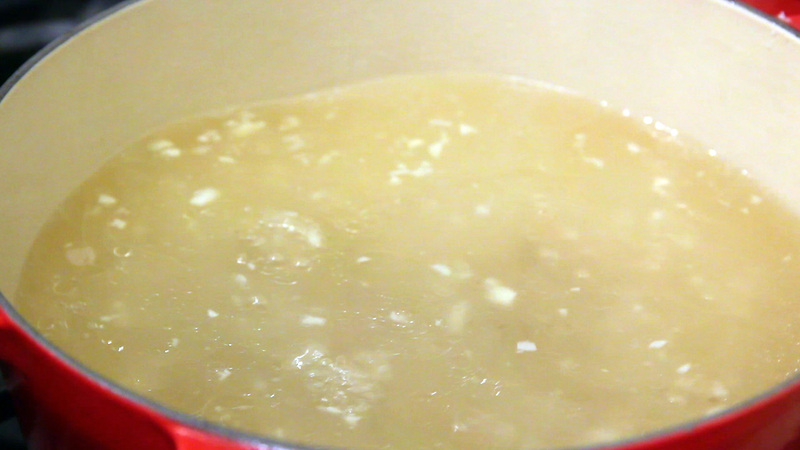 Put the clear broth back into the pot and remove any floating fat with a spoon. Add about 1 cup of starch noodles and the minced garlic. Bring to a boil for a few minutes until the noodles are cooked. Taste a sample to check: they should be soft yet firm, with nothing hard inside. Separate 2 egg yolks from the whites. Remove the white stringy stuff from the yolks. Mix with a pinch of salt. Add cooking oil to a heated nonstick pan. Swirl the oil around so it covers the pan, and then wipe off the excess heated oil with a kitchen towel so only a thin layer remains on the pan. Lower the heat to very low heat. Pour the egg yolk mixture into the pan and tilt it so the mixture spreads thinly. Turn off the heat and let it cook on the hot pan for about 1 minute. Flip it over and let it sit on the pan for 1 more minute. Slice it thin strips and set aside. Slice the radish into bite size pieces and put some into 2 large, shallow bowls. Add 2 or 3 ribs to each bowl. Add 2 teaspoons of hot pepper flakes, 1 tablespoon of chopped green onion, 2 teaspoons of soy sauce, 1 teaspoon of sesame oil to each bowl. Mix well. Reheat the soup and add some broth and noodles to each bowl. Add the gyerannoreunjajidan on top and sprinkle with chopped green onion. Put a bowl of salt and a bowl of chopped green onion on the table, as well as a pepper grinder. Diners can add salt, green onion, and pepper to taste. Serve with rice and kimchi. You can also serve with some other side dishes if you want to. Posted on Friday, March 22nd, 2013 at 6:28 pm. Last updated on June 23, 2017. Posted January 13th, 2017 at 10:32 am | Log in to reply. I’d like to ask you, I don’t really like radish, can I substitute it with something else when I cook this galbitang? Posted December 13th, 2016 at 3:51 am | Log in to reply. Posted July 18th, 2016 at 1:28 am | Log in to reply. I made this today and it turned out really delicious. My husband is not a big fan of soups and likes food that is very very flavorful so this soup is a bit bland for his taste. So for him I chopped up the meat and put everything for the Galbitang on top of rice without the broth. Mine I had as soup with lots of hot pepper flakes. Thank you for all the wonderful recipes! Posted July 19th, 2016 at 4:20 pm | Log in to reply. Congratulations! It looks so delicious! Posted September 28th, 2014 at 9:16 pm | Log in to reply. Maangchi-noona! 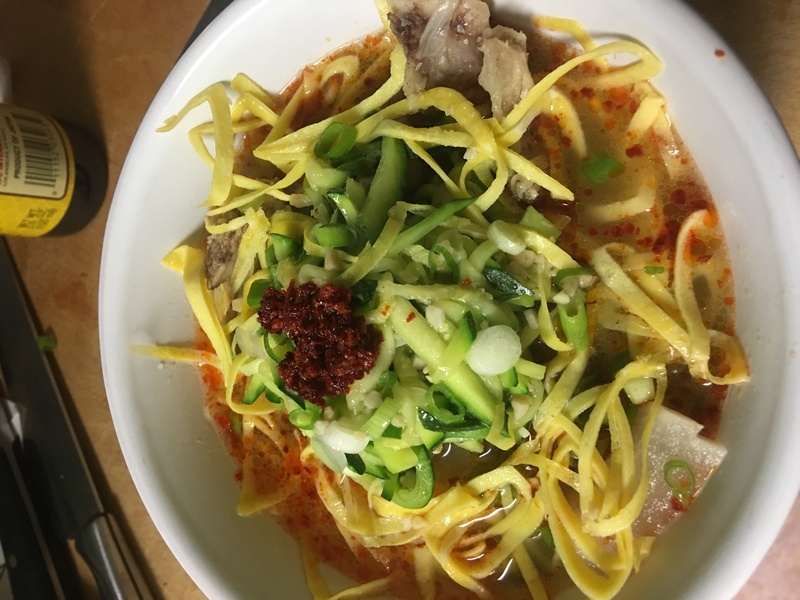 My wife is Taiwanese and has been cooking amazing Korean food at home since we got married two years ago… thanks entirely to your website. My tummy thanks you! Her favorite dish, funny enough, is ugeoji galbitang – which she doesn’t know how to make. Would it be possible for you to explain how to easily transform regular galbitang to ugeoji galbitang? We are HUGE fans – thank you again! Posted September 30th, 2014 at 4:42 am | Log in to reply. I’m glad to hear that your wife makes delicious Korean dishes and my recipes are helping you guys. You can make ugeoji galbitang easily. Ugeoji is dried napa cabbage leaves. You can use blanched napa cabbage leaves. Add some chopped blanched cabbage, garlic, green chili pepper to your galbitang and salt with doenjang (fermented soybean paste). Good luck! Posted June 20th, 2013 at 4:59 pm | Log in to reply. I love your recipes very much. But why do you wash the meat so much? I am worried about making the meat less flavorful if I soak and rinse it. Posted October 4th, 2013 at 11:27 am | Log in to reply. Maangchi says in the worded instructions: To remove any residual blood and bone fragments and remove any visible fat. Posted June 19th, 2013 at 7:00 am | Log in to reply. Hi I love all your recipe, i used to cook them since i am here at korea..My mother in law and my husband love the taste. thanks to you Maangchi..
Posted May 1st, 2013 at 3:50 pm | Log in to reply. Posted April 12th, 2013 at 6:10 pm | Log in to reply. maangchi im sorry i dont understand what to do with the egg . is the yellow strips shredded egg or pickled daikon ? Posted April 12th, 2013 at 6:15 pm | Log in to reply. It’s gyerannoreunjajidan (yellow egg paper strips). Posted April 7th, 2013 at 5:42 am | Log in to reply. Maangchi! Greetings from India! I love your Korean food. In India, Korean restaurants are quite rare so it is so nice to follow your recipes and make at home. Your Geotjeori and Bibimbap is famous among my friends. I loved this soup. I do not eat beef so I replaced it with Lamb and it was still very delicious. I used Indian Radish instead of Korean. A twist to your original flavour! Indians like spicy food so I made spicy version! Posted April 3rd, 2013 at 7:11 pm | Log in to reply. Miss Maangchi, this looks so delicious and easy to make!! I am living in a dorm without a kitchen right now :( But next year I’ll have one! I will definitely make this soup. It looks perfect for the fall and wintertime. I’m so grateful you always post your recipes, you are really so talented! I hope one day I can feed my children as well as you. Posted March 26th, 2013 at 5:29 pm | Log in to reply. Posted March 26th, 2013 at 3:00 am | Log in to reply. I just wanted to ask, if soy bean paste can be used for cooking other than soup for example used for cooking stir-fry vegetables ??? Posted March 26th, 2013 at 12:22 pm | Log in to reply. Posted March 24th, 2013 at 2:12 am | Log in to reply. Posted March 23rd, 2013 at 10:03 pm | Log in to reply. I love galbitang. Sometimes I like to add slices of Jalapenos for that kick. My mom always tells me that eating all this spicy food is going to catch up to me later. But I can’t help it. I love spicy! And I cannot eat this dish without Kimchi either. Posted March 23rd, 2013 at 11:22 am | Log in to reply. Going to H-mart to buy radish today, so I can make this soon. Looks soooooo yummy! This recipe was originally posted on March 22, 2013 at 6:28 pm by Maangchi. It was last updated on June 23, 2017. The video was watched 639,061 times on YouTube & has 6,922 likes!